Debating the New Atheists, such as the late Christopher Hitchens, can be intellectually stimulating. Hitchens, of course, wrote the awful book God Is Not Great: How Religion Poisons Everything. Hitchens’ claim notwithstanding, it’s fairly easy to trace Christianity’s benefits to society throughout the ages: the creation of hospitals, universities, soup kitchens, and orphanages without number, not to mention major contributions to art, literature and science. Recounting these historical facts never gets old. The “grace effect,” he explains, is what happens when the values and worldview of the Christian faith seep down into the roots of a culture, eventually bearing fruit that refreshes us all, even those individuals who choose not to believe. But how does this grace effect play out in individual lives? Larry’s fantastic new book tells the story of how he and his family surmounted one bueaucratic barrier after another to adopt Sasha, a special-needs girl living in Orphanage No. 17, in Odessa, Ukraine. For Larry and his family, Orphanage No. 17 was a proving ground about how worldview matters, about how a secular, statist mindset leads to hopelessness. The only rays of light in what Larry describes as a “grassless, treeless, lunar landscape” where Sasha and the other orphans lived came as the result of a previous visit from American Christians. They had decorated the rooms in bright colors and left the children with Frisbees, storybooks and other tokens of grace. Yet the decades of atheism eating away at the roots of Ukrainian culture have borne much bitter fruit in the lives of children such as Sasha. After adopting Sasha and taking her home, Larry’s wife, Lauri, scolded the child for carelessly breaking some dishes, and then quickly apologized. “That’s okay,” Sasha replied. “You don’t have to apologize to me. I’m different.” By that, she meant that she did not deserve an apology. Sasha had learned via the orphanage’s “law of the jungle” that orphans were unworthy of anything good, and the atheistic culture in the Ukraine gave her no reason to think otherwise. Thank God, the Tauntons have been slowly undoing that ugly, godless worldview, showing Sasha that she has inherent dignity and is loved by a God who sent his Son to redeem her. As Larry and his family have shown, sometimes our lives and what we do are the most powerful apologetic. Unfortunately, there are times when we evangelicals fall into a rationalist Enlightenment mindset where our faith consists mostly of intellectual and theological tenets. We then think we can argue someone into believing; that it’s all about what we believe intellectually. But what we really believe is shown in how our convictions are translated into action, into selfless love for others. What believers did in that Ukrainian orphanage, what Larry and his family did in adopting Sasha, what we do, is hugely important. In fact, it is the most powerful apologetic of all. 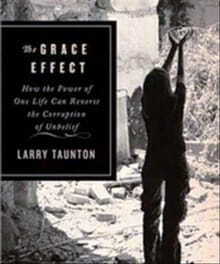 Come to our online bookstore at BreakPoint.org to get yourself or a loved one a copy of Larry Taunton’s The Grace Effect.